Surah Fatiha is a very beneficial Surah, revealed in Holy Quran. There are great rewards for people who recite Surat Fatiha. Muslims recite this Surah in every prayer because our prayers are incomplete without the recitation of Surah Fatiha. It is complete and perfect Dua which Allah himself teaches to Muslims. Surah Fatiha has the summary of whole Holy Quran in it. 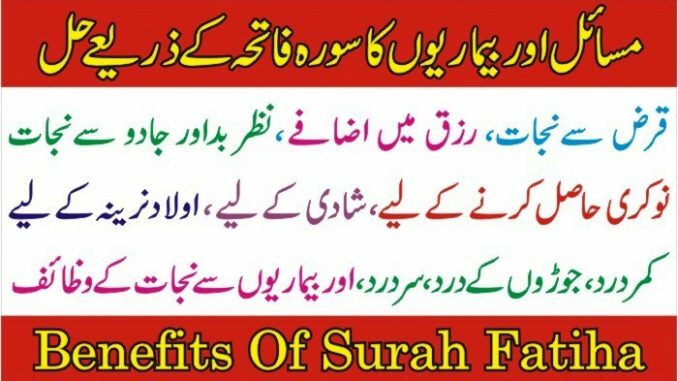 Three time reciting Surah Fatiha gives the reward of two Quran e Pak. The readers of this Surah come under the protection of Allah, the greatest protector in this world. 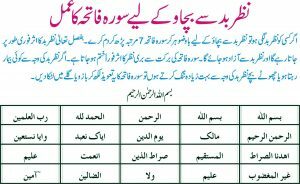 Hazrat Muhammad (PBUH Says “Surah Fatiha is Cure from every illness”. Recitation of Surah Fatiha is the best treatment to cure many diseases as one name of it is Ash-Shifa. This Surah is very effective to remain safe from the fear of enemies, to cure poison, to get rid of poverty. In pain recite Surat Fatiha the pain will vanished. Recite this Surah regularly and get rid of all kinds of problems. 1. If someone is suffering from high fever, recite Surah Fatiha 40 times and blow on the patient and also offer water to drink. 2. To cure headache, put your hand on head and recite Surah Fatiha 7 times and repeat the verse # 4 i.e iyak a naubdu wa iyak a nastaeen three times. To fulfill your any wish, recite this Surah Fatiha along with Tasmeeiha Shareef 100 times and then pray. Recite Surah Fatiha after Namaz e Fajr and blow it on water, it give shifa to any patient and he will get well soon. Must recite Darood e Ibrahimi before and after wazifa. 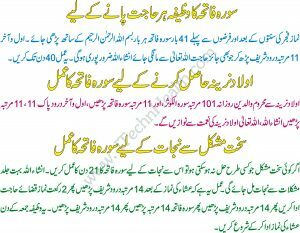 To find a job do this wazifa for 4 weeks. Start on the first Monday night of an Islamic month.Read Surah Fatiha with full bismillah each time. Recite Surah Fatiha 70 times. Recite Darood e Ibrahimi before and after 7 times. Recite Surah Fatiha 60 times. Recite Darood e Ibrahimi before and after 6 times. Recite Surah Fatiha 50 times. Recite Darood e Ibrahimi before and after 5 times. Recite Surah Fatiha 40 times. Recite Darood e Ibrahimi before and after 4 times. Recite Surah Fatiha 30 times. Recite Darood e Ibrahimi before and after 3 times. Recite Surah Fatiha 20 times. Recite Darood e Ibrahimi before and after 2 times. Recite Surah Fatiha 10 times. Recite Darood e Ibrahimi before and after 1 times.